Our house is from the 70s, so along with the stylish original light fixtures we find our ourselves surrounded by lots of dark wood trim. 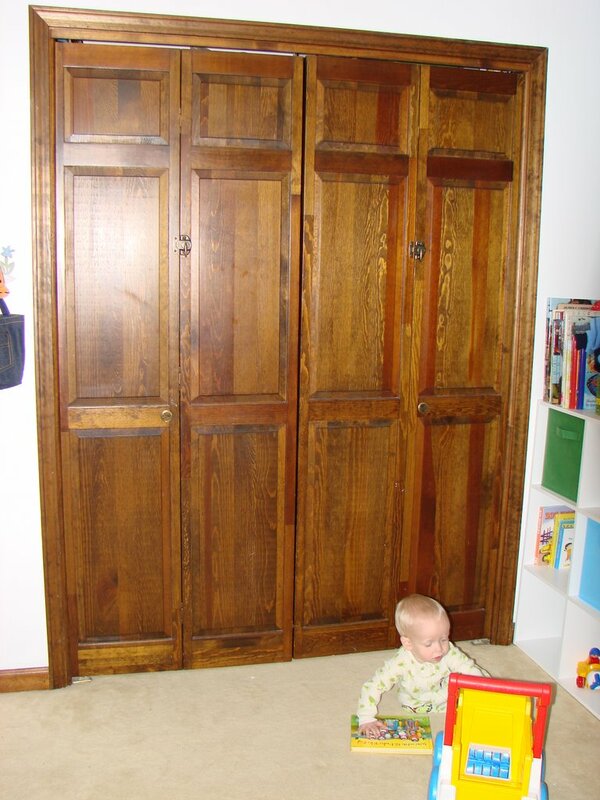 It is quality wood and in relatively good condition, so we're not looking to remodel. How do we keep a curious baby from smashing his finger in bi-fold doors and/or exploring all the stuff I've hidden from him in his closet? Good question. First, we bought the sliding, over-the-door, adjustable brace from Safety First. Our doors seemed average in depth- neither thick nor thin, but they only worked with this brace when it was fully extended. Even with full extension, the doors could still easily be cracked enough to place a finger in the gap. The braces added just enough resistance to then snap shut with the forcefulness of an angry animal. Great, we've made a baby trap. The precarious situation seemed short-lived as the Safety First brace made creaking plastic noises when challenged. Maybe that was the designer's idea for an advance warning system (as if the baby's cries wouldn't be enough to alert adults). So we googled for a better solution. Many web sites recommended taking the doors down and replacing them with a curtain on a shower curtain or cafe rod. Do these people have children or style? Why would I want my baby to have the run of the closet? Don't they know I want his freedom completely curtailed? Plus, the little primate loves to pull the bottoms drapes and shades, so the curtain rod wouldn't remain aloft long. One inspired individual (I'm sorry I can't find the link anymore) suggested using bar clasps or the uglier, but more easily hook and eye latches. 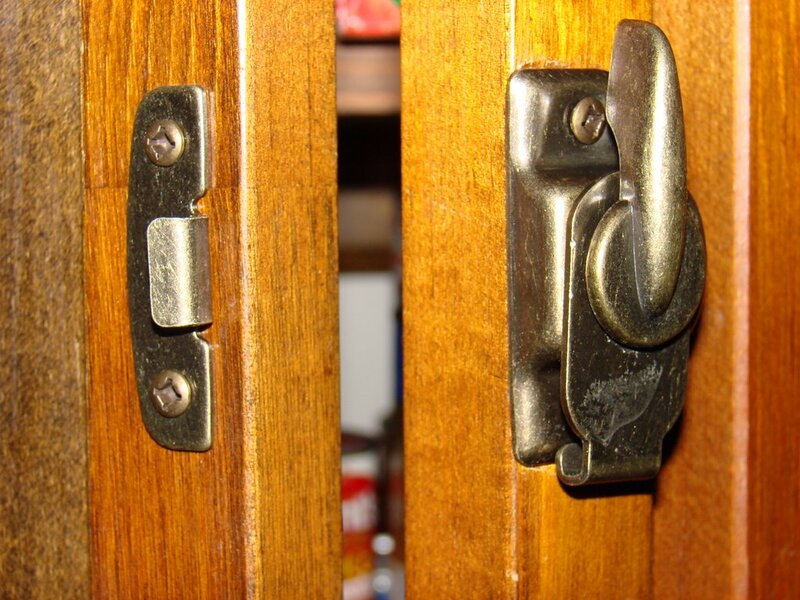 Hook and eye latches are difficult to keep anchored, so we went shopping for bar clasps. Our home improvement giant didn't carry any attractive bar clasps, so we opted for window latches with cams (pictured below). The installation requires a power drill and took only 20 minutes. 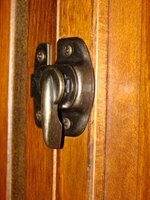 The latches are anchored at two points, so they are less likely to pull out than a hook and eye set. This babyproofing solution might work for a hollow-core or metal door bi-fold with appropriate anchors or other hardware. As we don't have any to test on, you might want to consult your local hardware guru before drilling any holes. We're really pleased with the end results functionally and aesthetically. 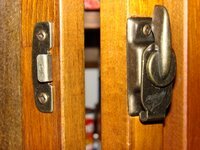 The doors look a bit nautical to me (as ship cabinets can be secured) and they hang more neatly with the latches than they have since their installation in the 1970s. The new closures keep the doors' lines straight which is really pleasing to the eye. The latches open and close easily with one hand. 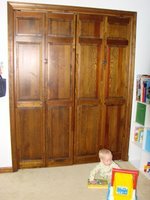 Which is important; really, really important when you consider trying to move stuff in and out of the closet (like laundry) while blocking an inquisitive infant or toddler with your body. Baby Geek is unable to budge the doors when secured which makes everyone but him quite happy. We put the latches high enough that he will be unable to reach them until he is in late elementary school (although this is a matter of personal preference). The solution is only slightly more expensive than the plastic slider, but it works and looks much better. We discussed the resultant holes in the door and decided that we will probably leave the hardware in place for the life of the doors. 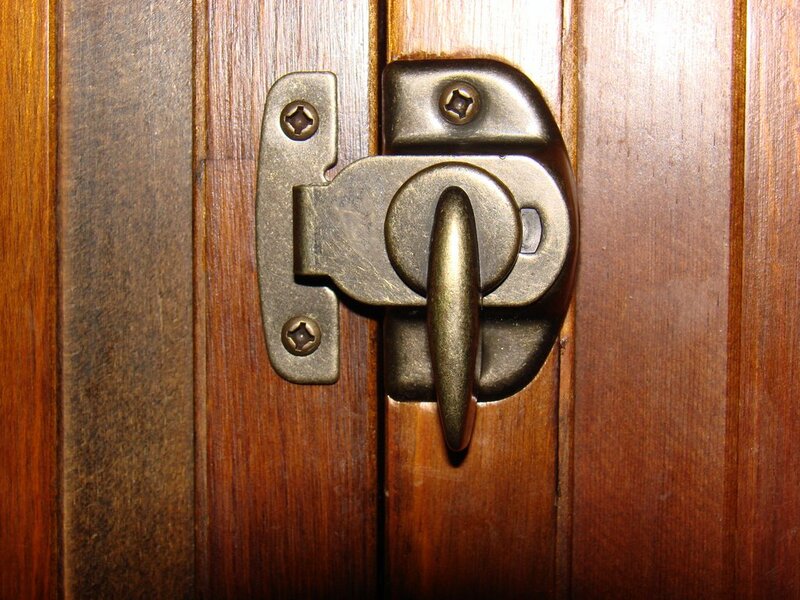 The latches are pretty innocuous in appearance and will allow the little geeks hours of fun trapping each other in the terrifying darkness. We also installed them on our kitchen pantry doors and our guest room bi-fold closet doors (in case of child and infant guests). 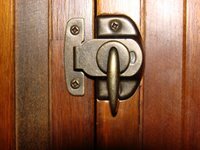 The latches we chose come in a few metal finishes, we went with the brass tone prevalent around our home, but there are more modern finishes (chrome, pewter, gold). Each latch cost around $3.50 equalling $7 a set/closet. My last post recommended music to help soothe baby while teething. How naive. Baby geek seems to be getting all his teeth at once, including molars, and it has been a painful experience for us all. When I realized that holding him and rocking him to sleep results in my right ear ringing for a few hours I resorted to those little foam-insert ear plugs for use with small power tools. The foam plugs could take the edge off the shriek, but lacked the oomph to bring the banshee wail down to a reasonable decible level. Plus, they get lost easily, are choking hazards for infants, and have a slightly tacky texture that bonds permanently with pocket lint (just in case you thought there was an easy solution to the first two complaints on this list). If you really want, you could continue to use the foam plugs under the muffs for increased noise reduction. Anyway, these aren't magic; you will still hear your baby cry, but they extend my own patience and ability to hold him close when he's deafeningly loud. They are easy to locate with their flashy yellow color, they hang over a chair back or doorknob, and cannot easily be swallowed by infants. They're also versatile and useful after the baby outgrows wailing (about age 24). You can also use them to muffle power tool noises and your teenager's choice of music. $9.99 at my local Rural King. I didn't plan on writing today, but baby geek is so unhappy with his molars coming in that I'm resorting to music therapy to get him napping. Reassuring (gentle, but strong) female vocals present traditional lullabies with Celtic instrumentation and interpretation. It's very peaceful for baby and bystanders. It's baby Valium with a touch of Prozac for beleaguered caretakers. As he's gotten older and better at fighting sleep, the CD has lost some of its somnolent powers, but it usually calms him down immensely. This is a great gift album for parents of newborns. Eden's Bridge's "Celtic Lullabies" at Amazon. This week we got some exciting new kids' cds from www.cdbaby.com (a great site where artists receive a much larger piece of the purchase than through other online retailers- support your favorite artists better without paying more). We love music. Baby geek is already an adept little beebopper who dances or bounces his head along to the music we play. He loves the blues, bluegrass, folk, classical, oldies, and even accordion music. We soon hope to teach him the phrase "More cowbell!" but alas, these things take time. So here are some great new purchases. We'll try and catalog some family favorites as time goes on, but it would be a huge endeavor to catalog them all tonight. I'll just summarize by saying you can never go wrong with Dan Zanes, Keb Mo', Lyle Lovett, Cheryl Wheeler, or Trout Fishing in America. I found this cd at the library while looking for farm songs for a friend's party. The artist's name didn't spur any recognition, though it should have as Sara Hickman's beautiful vocals and lyrics shaped one of my favorite albums Three Women (Domestic Science Club). Jim immediately recognized her voice and it was like uunexpectedly finding a long-lost friend. The cd is musically cohesive while showcasing a wide range of musical styles and songs (a capella, retro, contemporary, jazz, folk...). The music, the musicianship, and the production are superlative. This cd is great for music snobs but presents no barriers for the hoi polloi (us). "More is always better," this is my dear friend Kathryn's ("Queen of the Gilded Lily") motto. I don't always agree with her on this, but in the case of Sara Hickman it appears to be quite accurate. Toddler is a faster album than Newborn, but equally joyful. It shows the same diversity of songs aand styles and adds new elements of spoken word stories. We started singing "Weenie Man" to calm a minor meltdown in a restaurant and ended up making up a special geek family version of the song. 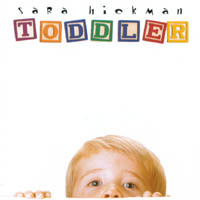 In the liner notes for this series, Sara Hickman writes that she would like families to have the confidence to improvise fun songs with their kids, and I think her music inspires us. I actively resisted this cd when my husband handed it to me at bookstore listening station. Like many other geeks, Jim has an undeniably crow-like tendency towards bright and shiny objects. I was going to put this back on the shelf because the first song "I Chalk" threatens to be one (especially if you're not paying attention) one of those peppy bits of ear-treacle about shoe tying and the wonders of being a kid. 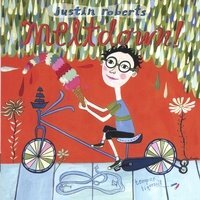 The whole thing seemed like it might be too Raffi, too "How Much is that Doggy in the Window" optimistically simplistic for a cynic like myself, but when I hit the title-track "Meltdown" I found an album with sounds reminiscent of R.E.M., early They Might Be Giants, and other contemporary & indy greats with an unexpected sense of humor to keep adults surprised and entertained. Listen to, and buy these cds at www.cdbaby.com where musicians get a better cut of the purchase price, independent artistry is encouraged, and they let you listen to more of the tracks in their sample clips. I had planned to list more cds tonight, but I have miles to go before I sleep, so you'll just have to wait with baited breath.